Since they will exercise private sacramental Priesthood for home gatherings, spiritual practice, and the education of others, Home Templars are required to undertake serious study and training. The Home Temple qualifies Postulants and Candidates for Holy Orders through a self-paced course of studies designed, simplified, and guided by scholars based upon the profound spirituality of Mar Yeshua, the Master Jesus. Sincere men and women of any educational background may undertake training, which is offered in English and some of it in Spanish. Completion of seminary training does not guarantee Ordination. If impediments to Ordination are discovered after acceptance into the seminary program (criminal activities, non-disclosure of previous abuse of clerical authority, etc. ), the Presiding Bishops may elect not to authorize Ordination in the Home Temple. Diaconate and Priesthood Study Modules (see CURRICULUM), which can be completed in less than a year. to the Episcopate as a Bishop. (C) successful completion of the First Order Empowerments of the Temple of the Holy Grail. For details scroll to bottom of SCHOOL OF SACRED STUDIES page. For the duration of Ordination studies, Subdeacons and Deacons work with special spiritual practices designed to connect the student with authentic practices of the Master Jesus, including the keeping of a Kabbalistic Shabbat seder and brief morning and evening meditation and contemplation with daily journal entries. Students are also encouraged to undertake T:.H:.G:. esoteric studies and practices. 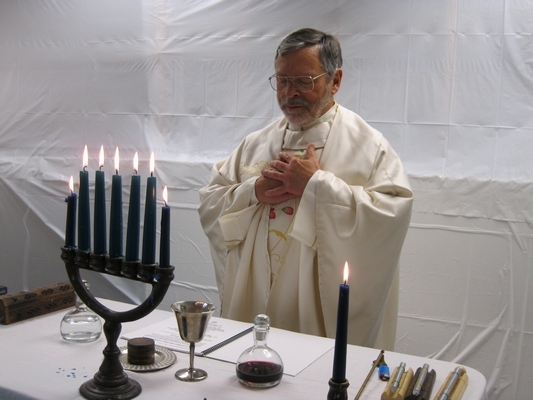 The Kabbalistic Eucharist of the Home Temple is designed to develop basic principles for powerful and effective liturgics in the context of the form of mystical communion developed in the Messianic Havurah seder of Mar Yeshua and his disciples. After Ordination to the independent Priesthood, Ordinands are under no obligation to continue using the Home Temple Sacramentary and rituals, whose purposes were specifically for training, but may adopt or create whatever rituals best reflect their ministries. After Ordination, Priests and Priestesses operate their own independent ministries in compliance with the Home Temple Code of Ethics. They are licensed under a Home Temple Bishop of their choice, and they may apply for a legal Church Charter by the Home Temple. They are empowered to use any liturgy, theology, vestments, or other orientation that seems best to them--Christian, Buddhist, Wiccan, Jewish, Hindu, Taoist, Theosophical, etc. Their only obligation is to keep the Code of Ethics. They pay no dues or other fees to the Home Temple or their Bishops, but are expected to keep in collegial contact and link their web site or e-mail address to the list of churches in the Home Temple online and other published directories. Those who develop effective ministries will be nominated by their Bishops and formally invited for advancement into the Independent Episcopate. HOW DOES THE PROGRAM OF STUDIES WORK? Those who are accepted into the Subdiaconate as Postulants for Holy Orders pursue a curriculum of home studies with online audio, video, and written materials. They include topical courses that have been organized and simplified from curriculums taught in Jewish and Christian seminaries, as well as unique and relevant materials developed specifically for Home Temple students. Students submit written answers in the topical studies and undergo a process of self-exploration and development integrating teachings and practice, for which a spiritual diary is submitted. When this is successfully completed, usually after about six months, they qualify as Candidates for Ordination into the Apostolic Succession as Deacons of the Home Temple. They continue with studies to qualify for Ordination to Priesthood--four to six months more. The Bachelor of Divinity or B.D. Degree is conferred along with Ordination once the Priesthood Studies have been completed. When a Postulant for Holy Orders has completed studies and qualified as a Candidate for Ordination to the Priesthood, he or she travels to a Home Temple Bishop for a Saturday orientation and Sunday Ordination done in the context of a Eucharist. Candidates for Ordination to Diaconate may choose travel to a Bishop for laying-on of hands, or they may accept certification from the Presiding Bishop authorizing them to function as Home Temple Deacons until they complete the Priesthood studies and can afford to travel for hands-on Ordination simultaneously to both Diaconate and Priesthood. Presiding Bishops will evaluate Candidate's seminary education and design a supplemental course of "fast track"
Home Temple Bishops contingent upon completing Fast Track studies and all First Order Initiation and Empowerments of T:.H:.G:. Send in a regular Application Form and copies of seminary transcripts. The Presiding Bishops will evaluate the Candidate's seminary education and design a supplemental course of low-cost "fast track" selected Home Temple studies that must be completed for Apostolic Ordination into the Home Temple Priesthood. Minimally, T:.H:.G:. First Order Initiation and Empowerments will be required as well as training in Liturgics, Sacramentary, and general orientation to the Kabbalistic teachings and practices of Mar Yeshua offered online in the Yeshua Seminar and the exegesis seminar on recovering the historical teachings of Jesus entitled Yeshua: The Unknown Jesus. A two-year PATREON sponsorship is required. Take this link to the ONLINE APPLICATION FORM. The RESOURCES button below will take you to a page used by Home Temple Seminarians to augment studies.